Definition at line 41 of file lluseroperation.h. Definition at line 46 of file lluseroperation.cpp. Definition at line 54 of file lluseroperation.cpp. Definition at line 71 of file lluseroperation.cpp. Definition at line 65 of file lluseroperation.cpp. Definition at line 90 of file lluseroperation.cpp. Definition at line 49 of file lluseroperation.h. Definition at line 48 of file lluseroperation.h. Referenced by LLUserOperationMgr::addOperation(), and LLUserOperationMgr::deleteOperation(). Definition at line 80 of file lluseroperation.cpp. References FALSE, LLFrameTimer::getElapsedTimeF32(), mNoExpire, and mTimer. Definition at line 75 of file lluseroperation.cpp. Definition at line 73 of file lluseroperation.h. Definition at line 76 of file lluseroperation.h. Referenced by isExpired(), and SetNoExpireFlag(). Definition at line 75 of file lluseroperation.h. Definition at line 74 of file lluseroperation.h. 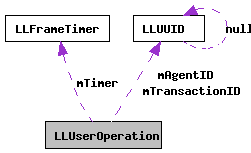 Referenced by getTransactionID(), and LLUserOperation().